Southeast India, Pondicherry (Puducherry) has a population of just under 245,000 and is located on the shores of the Bay of Bengal. Former French counter, the city has a very special atmosphere and charm, which distinguish it from other cities in the country: street names written in French, residents playing petanque, colonial houses, many traces of French colonization enamel places. The traveler will also discover the market with its stalls of food and fabrics; the museum installed in a beautiful colonial house and which traces the history of the city; the "croisette" of Pondicherry where to take a very pleasant walk; the Muslim quarter; the former residence of the French government, Rai Nivas; Arulmigu temple Manakula Vinayagar; the statue of Gandhi on the seafront; the SITA Cultural Center, where you can take classes of all kinds, cooking, massage, languages, Ayurveda, etc. ; and of course Auroville, a few kilometers from Pondicherry, the famous "universal city" created in 1968, with its atmosphere of peace that still emerges today, and its center of meditation, to experiment absolutely. Puducherry is reached by landing in Chennai and then taking a three hour drive. 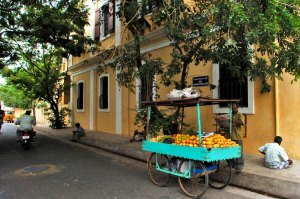 In the city, you can walk or cycle in the center, then rent a scooter or motorbike, or take a rickshaw or a taxi to the outlying areas.